I woke up very much wanting to paint, but half way through the morning, found myself feeling under the weather. 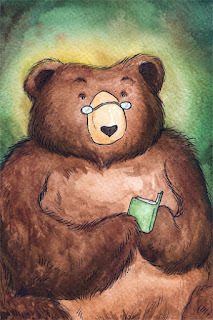 I felt certain I wouldn't be able to paint, and it bummed me out so much I--wait for it--painted this bear. He's been in my head for a little while now, and I'm happy he showed up on the page today. He's enjoying a quiet afternoon with a book, much like my octopus, and his calm, serene nature made me feel better. I don't think he will be offered as a print, instead he may be a little freebie print I tuck into packages when folks order from the shop. I'm not entirely certain yet, but I have wanted to have a tiny, exclusive print to give customers as a thank you, and he seems like a nice one. We'll see! I'm just so happy to have painted something again :) Sometimes a painter's block can feel like it will never end.